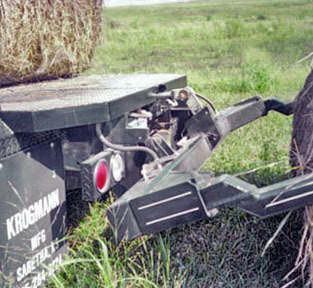 The Krogmann BaleHandler – Hydraulic balebed / flatbed for pickup trucks built to handle big round hay bales by Krogmann Manufacturing, Sabetha, Kansas. Bales on balebed white Dodge. 7 1/2' Long balebed on short wheelbase pickup. Krogmann's BaleHandler is excellent balebed/flatbed equipment for standard and dually trucks available in 7' or 8' widths. With its lifting capacity of 2500 pounds, this machinery is for the serious cattlemen, sportsmen and livestock agricultural producers served throughout the United States. Krogmann Balebeds are for both new and or older pickups. The package includes standard features which make Krogmann the preferred choice. Optional components such as custom building for shorter or longer pickup beds and third spool valves offer flexibility to fit unique needs around the farm and ranch. Engine driven or all electric models are available. Contact Krogmann with questions or to get more information. Krogmann engineering doesn't stop with the hydraulic Balebed they manufacture. Another of our products, the Carry-All, handles 4-wheelers, small equipment and materials on the farm and ranch and is used to hydraulically lift, haul and dump. 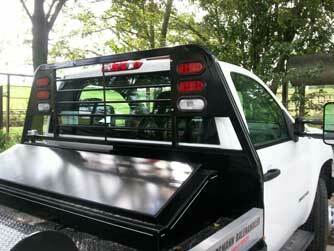 We also manufacture across-the-bed, underbody side toolboxes. Feedback proves Krogmann's “workhorse reliability and satisfaction”. Please call for further information or stop by for a demonstration. 1/8" deck plate with heavy 3" channel iron cross members on a 5" channel iron main frame offers a tough, long lasting bed for many years to come. Arms fold down on top of the bed to make self-forming sides. Cylinders are enclosed in the rear tube for safety and durability, with end cap access. Clean design has less area to catch hay and bind. 30,000 lb. recessed gooseneck ball under trap door. Spinners, set above the bed, do not have to be removed when setting down the arms. They will not hit the bed and will manually extend up to 16" for ease in putting bales in feeders. Rear access door hinges forward so cylinder doesn't damage it. 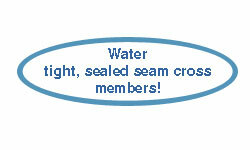 Flush mounted stainless steel hinges make a smooth surface. Custom-built shorter or longer beds. Optional third spool valve for constant on. Across-the-bed toolbox 70"L x 10"H x 20"W – complete with stainless steel hinges, tray and gas shock. Side toolboxes 30"L x 17"H x 12"W – standard size of 12 ga. steel with stainless steel hinges and latch. Complete with dual chains which offer enough support so the door can be used as a step. New 8' wide bed or flared standard bed for dually pickups. Carry-All attachment lets you lift, haul and dump. The Krogmann Balebed looks great on new pickups or older models! Haul two big bales with ease from the comfort of your pickup. Lift Cylinder One 4' X 20"